There are not too many things that I can say have scared me, there also aren’t a lot of things that I can say have hurt me. Being a veteran I’ve been through some painful situations as a soldier, but they were usually very brief. Interestingly enough, I kind of enjoyed those experiences; I likened them to the “No pain, no gain,” mind set. My drill sergeant would say, “Pain is weakness leaving the body. Embrace it!” And I did. It is interesting to start this talking about pain. Normally this is something I don’t really talk about, but recently I experienced it in such a magnitude that it brought tears to my eyes. That is also saying a lot, because I don’t cry easily. The last place I thought I would ever experience something like this was the dentist office. 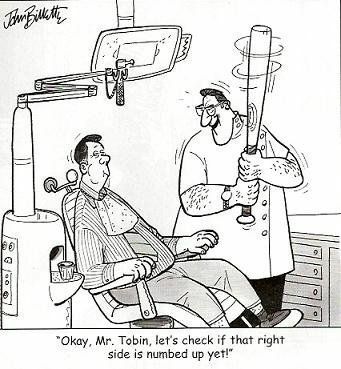 I hear about people being afraid to go to the dentist and those fears are usually grounded in nothing but anxiety. I never quite understood it really. I am now one of those people with a genuine fear based on an experience that I can only describe as traumatic. When I told some folks about my visit to the dentist, they kind of chuckled when I said it hurt, that is until I explained in detail why it hurt. Most were thinking that I was in pain prior to sitting in the chair, and most certainly was not expecting me to talk about the pain coming from the chair. For reference, prior to this my most painful experience happened a couple years ago. I closed my thumb in a door. It hurt, but not as much as what happened next. The thumb had a line through it and a dark spot that started to form. Within hours the throbbing grew to a banging both in my hand and my head. My thumb started to swell and soon my fingernail was completely black underneath. The blood was filling the space under my name. I went to emergency and then I understood true pain. The doctor came over with what looked like a soldering iron and said, “This is going to hurt.” In my mind I thought it can’t be much worse than this, or maybe it’ll be the type of pain that brings relief; like when something hurts and you put pressure on it. This “hurt” that he mentioned, gave me an operating definition for excruciating. He took the tool and pressed it to my thumb. I watched as it neared my finger, tensed from the initial pressure applied and then… And then I tried to scream, but nothing came out. My head became heavy and the room went black and then it was back again. The whole event was probably about 1 second, but time slowed and dragged trapping me in the moment. That became my new definition and standard of pain. Who knew it would ever be challenged. Previous Previous post: Say Cheese!